A four-year labor of love transforms a derelict Catskill Mountains farmhouse into an effortlessly stylish amalgam of cutting-edge and country. In 2002, Tom Givone went out on a limb. 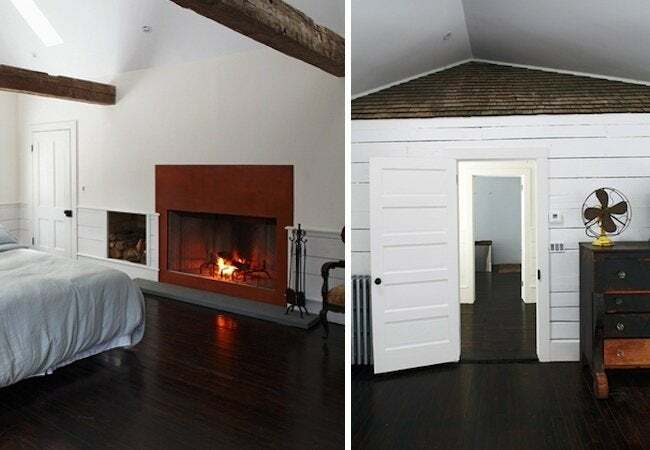 The former advertising copywriter decided to purchase and resuscitate a 19th-century farmhouse in Upstate New York. Thus began a four-year-long odyssey, filled with both physical and design challenges. The stop-and-start process was hampered not only by the delays and frustrations that typically accompany large-scale renovations, but also by the Great Recession. Today, however, the reborn structure carries no scars from the struggles that bedeviled its completion. 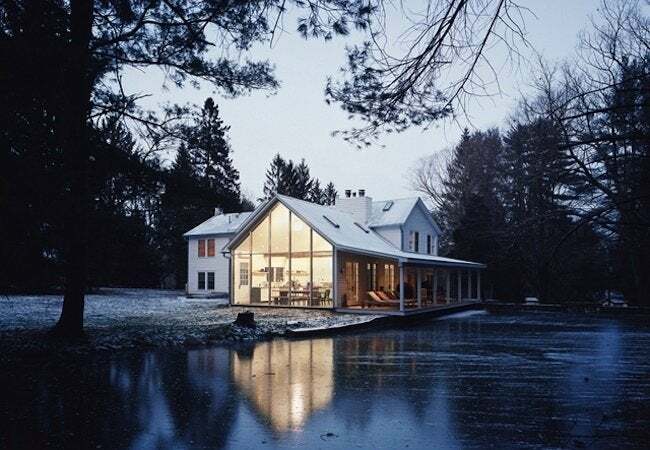 Rather, the Floating Farmhouse, as Givone Home calls it, blends old and new with seemingly effortless style. Probably the most stunning aspect of the Floating Farmohouse is the spacious, open kitchen, situated within a new wing, the gable end of which is composed entirely of glass and steel. Here, there are overtly modern touches—polished concrete floors, wraparound bluestone counters, and high-gloss cabinetry. But there are also testaments to the history of the farmhouse. For instance, antique hand-hewn beams salvaged from a dairy barn in neighboring Pennsylvania span the contemporary space. 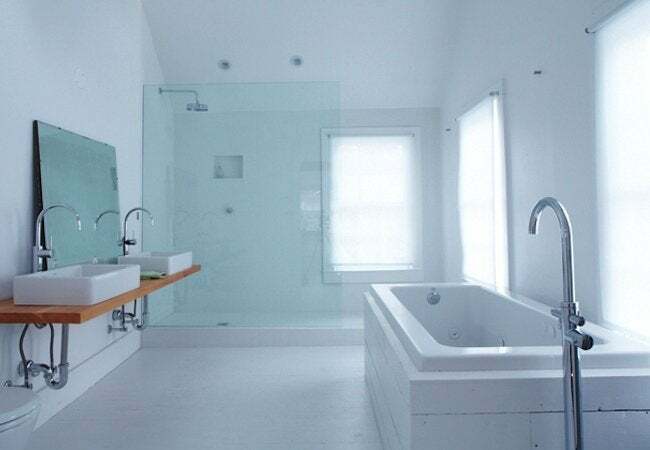 The luxuriously minimalist master bathroom features a nine-foot-long wall-to-wall shower, as well as a tub housed within a white-painted wood surround. Girding the vessel sinks is a countertop made from one of the 11 pine trees on the property that were felled and milled to provide most of the lumber used in the project. Cor-Ten steel frames the fireplace and serves as a bold focal point in the master bedroom. The airiness of the room owes partly to its all-white palette, but more so to the soaring vaulted ceiling. A pared-down version of traditional wainscoting travels the room’s perimeter, recalling the building’s origin. But a more overt reminder of the past comes from the original cedar shake roof shingles, exposed during the renovation and deployed here, along with roughly aligned planks, as decoration for the doorway. It’s hard to pick a favorite feature in the guest bathroom, but perhaps most noteworthy is the sumptuously imperfect Italian marble sink, which cantilevers into the room with no visible means of support (in fact, it’s hung by means of angle irons concealed within the wall). 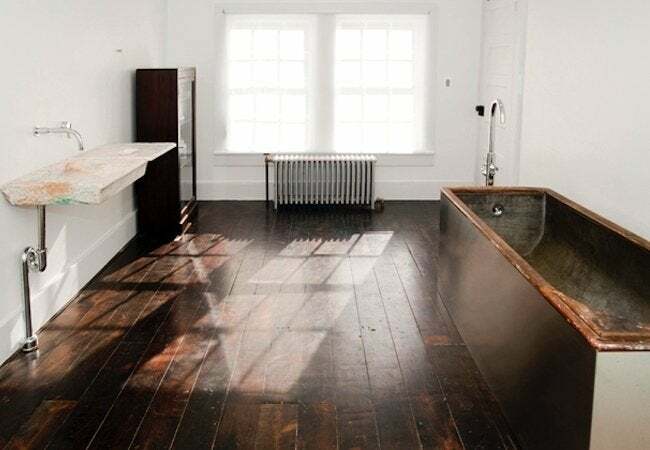 Also eye-catching is the wood-and-zinc tub, a 19th-century artifact rescued from a New York tenement building. Givone chose to wrap the vintage tub in stainless steel, again finding a way for different centuries to complement one another. 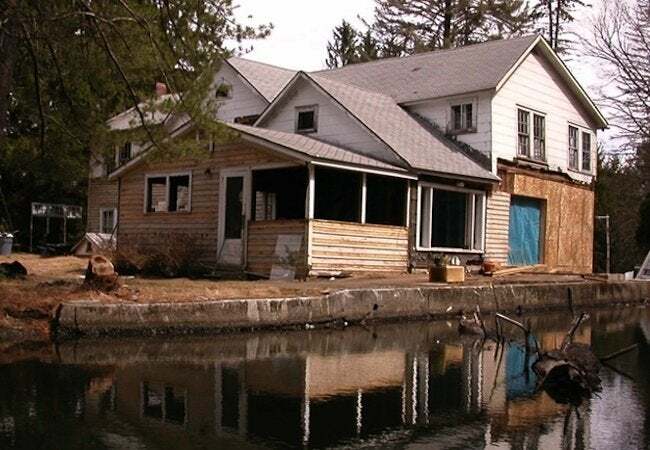 You can rent the Floating Farmhouse—located two hours north of New York City, in the Catskill Mountains—from $600 per night. Click here for details.